Review by AllTheBestFights.com: 2018-10-20, technical fight but not so exciting: Kid Galahad vs Toka Kahn Clary gets two stars. The undefeated Kid Galahad entered this fight with a perfect record of 24-0-0 (15 knockouts) and he is ranked as the No.19 featherweight in the world. In his last three bouts he has won over Leonel Hernandez, Jose Cayetano (Jose Cayetano vs Kid Galahad) and Irving Berry. His opponent, Toka Kahn Clary, has an official boxing record of 25-1-0 (17 knockouts) and he entered as the No.25 in the same weight class. He suffered his only loss when he faced Jhon Gemino in 2016, after this bout he has won six fights defeating Emmanuel Dominguez in 2018. 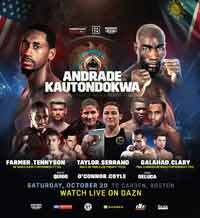 Galahad vs Clary is on the undercard of Demetrius Andrade vs Walter Kautondokwa. Watch the video and rate this fight!